UPDATED – WASHINGTON (CNS) — On June 12, the feast of the Sacred Heart of Jesus, Catholic churches around the world spiritually united in prayer for a Global Rosary Relay for Priests. “Originally, today’s feast was one of atonement for human ingratitude toward God, but today the church focuses on the great love that God has for us, directing us to draw joyfully from the spring of salvation,” Msgr. Walter Rossi, rector of the Basilica of the National Shrine of the Immaculate Conception, stated in a homily during a Mass prior to recitation of the rosary. The feast day is also the World Day of Prayer for the Sanctification of Priests, so the Global Rosary Relay was offered in thanksgiving for priests, and as a petition to Mary to care for and protect the world’s priests. The relay lasted 24 hours, with people at each shrine praying a particular mystery of the rosary at every half hour period. It began June 11 in the Church of Our Lady of Magadan in Siberia, and concluded June 12 at the Sanctuary of Our Lady of Guadalupe in Guatemala. The global rosary began in 2010 with 24 participating Marian shrines. This year 100 shrines in 50 countries participated. In Washington, Mass was celebrated in the shrine’s Crypt Church at 5:15 p.m., with the rosary following at 5:45 p.m. The shrine participated in the relay after the rosary was said at the Basilica of Our Lady of the Pillar in Buenos Aires, Argentina, and then it handed off the rosary to the Church of Our Most Holy Mother of the Light in Monterrey, Mexico. The event is an initiative of WorldPriest, a nonprofit Catholic apostolate with offices in New York and Dublin. The organization was founded by Marion Mulhall. 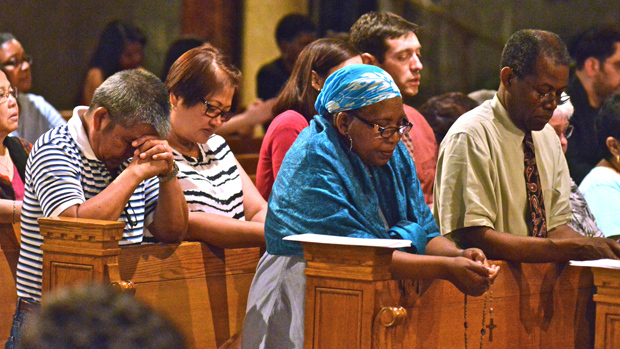 The congregation in Washington prayed the glorious mysteries of the rosary. The Mass began with the organ swelling with the sounds of “To Christ, the Prince of Peace” as nine priests and four altar servers processed into the church. The church was filled with laypeople as well as men and women religious who gathered to seek Mary’s intercession on behalf of priests. Following the prayer after Communion, Massgoers knelt to begin their portion of the rosary relay, with the priests who were concelebrants taking turns leading the decades. “The rosary is everything. Our Mother Mary leads us to Jesus, you can’t get close to him without her. She’s the secret to it all,” a parishioner of the national shrine said later. She identified herself only as Martha. The priest said he prays the rosary daily, and has for as long as he can remember. He also encourages all Catholics to take up the practice. “Everyone should pray the rosary, it is a great prayer. If you don’t pray it, start,” he said. Nearly 20 U.S. Marian shrines participated in this year’s relay, including the Shrine of the Grotto of the Redemption in West Bend, Iowa, where 25 people gathered to pray the sorrowful mysteries at 7 p.m. local time June 12. The grotto is in the Diocese of Sioux City and was recently designated a diocesan shrine. Each decade of the rosary was recited by members of the St. Gianna Cenacle, a group of women who have met monthly in prayer and fellowship for the past six years. Susanne Reding, a parishioner at St. Michael Church in Whittemore, Iowa, said the relay fit the cenacle’s focus — praying for priests, deacons and their wives, deacon candidates and their wives, seminarians and consecrated religious. So she contacted Mulhall about the grotto participating this year. Reding reported the relay came to West Bend from Las Vegas, then headed to the Sanctuary of Our Lady of Guadalupe in Guatemala. Martha told CNS she believes that unless priests are holy, Catholic laypeople have no hope of being holy. That’s why she daily offers up prayers for the priesthood, she said. Prayer, according to Msgr. Rossi, is a lifeline. “To pray for the sanctification of priests is to help priests along their own path to holiness, just like priests are hopefully helping our faithful along the path to holiness,” he told CNS. The Global Rosary Relay concluded with Msgr. Rossi leading the congregation in singing of the “Salve Regina” (“Hail Holy Queen”). Pope Francis imparted his apostolic blessing on the relay, assuring all those taking part in the event of his spiritual closeness. Msgr. Rossi believes events such as this are good for the local church as well as the universal church. Contributing to this was Joanne Fox in Sioux City, Iowa.